Are you a newcomer artist, craftsperson, architect or designer? Do you want to work on a community arts project? Please email us a cover letter outlining your interest in working in community arts, a resume that highlights your arts experience and link to your website or a portfolio with up to 10 samples of your work. Please email your application to karen@mabellearts by April 5, 2019 or call 416-239-4900 ext 2. for more info. Some potential barriers may take financial resources to address, but many can be tackled through creative thinking and the assistance of partners, community leaders and/or volunteers. What’s essential is thinking through these potential barriers as part of the planning process while also remaining responsive to accessibility needs as they arise. At MABELLEarts, we’ve been able to deepen our commitment to accessibility by responding to the needs of participants as they arise. For example, we began providing pick-ups and visual interpretation when we met Berle - a Mabelle resident who was visually impaired. We first sought the expertise of an ASL interpreter in 2016 - when we met Johann Fisch - a community leader who lives near Broadacres Park. Some other good resources on accessibility in the arts can be found here. At MABELLEarts we try to hire artists whose cultural backgrounds and artistic practices align with the communities we work with. This increases the relevance of what we’re offering and helps make participants feel welcome and included. It’s also incredibly exciting artistically to work in this way. If you are hoping to work with a cultural community that is different than your own, consider seeking cultural interpretation and advice from partners and community leaders. (We’ve often included this role in our budgeting process to insure we can pay for this service). Understanding religious protocols related to prayer and purification, food and the separation of women and men can help to make observant participants feel more welcome and included. Community art projects are made possible by the people who choose to give of their time and creativity and take part. Whether for an hour, the full duration of a production phase or over the many years of a long-term project, community members make vital contributions to art in parks and it’s important to acknowledge their efforts. It can be helpful to think through ways of recognizing community contributions as well as identifying opportunities for participants to benefit from their involvement in your project. This is especially true when working with newcomers to Canada who face incredible pressure to gain Canadian experience and find employment. At MABELLEarts, we see anyone who takes part in our projects as a volunteer and a potential leader. We publicly acknowledge participants during events, track participation hours, and write letters acknowledging their contributions—which can be helpful with early job-hunting efforts. We’ve offered subway tokens, food and childcare. With our community leadership program, we provide honoraria to community members who make specific contributions, i.e. by preparing food for workshops and events. We also employ community members as: workshop assistants and one-on-one facilitators; child-minders; translators, and; cultural interpreters. Sometimes we establish advisory committees to help plan and envision our projects, thereby ensuring that our plans make sense for the people we hope to engage. MABELLEarts is a community arts organization in Central Etobicoke that brings together people of all ages, backgrounds and abilities to make art and build environments that foster community regeneration, invention and connection. We cultivate long-term relationships that reveal the transformative possibilities within each unique site and neighbourhood. We celebrate cultural traditions, differences and points of connection that help spark collaboration as a creative force for change. We are seeking an experienced Program Coordinator to manage our growing programs with a demonstrated interest in arts programming; a highly-responsible creative thinker and self-starter with experience working with professional artists and people of all ages from a range of cultural backgrounds; and demonstrates an understanding of the challenges faced by marginalized communities. 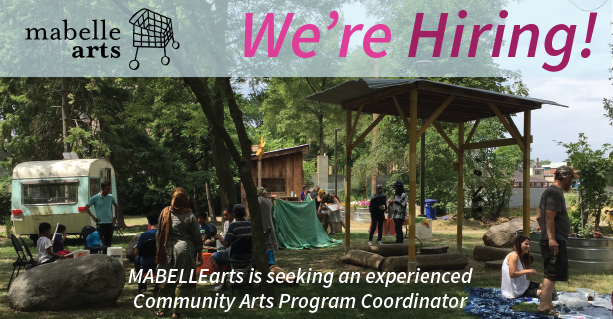 The Program Co-ordinator will work from the MABELLEarts Office (5005 Dundas Street West) and off-site as needed. Present verbal and written reports and represent MABELLEarts’ programs publicly. Develop policies, procedures and standards for volunteers using current resources as a springboard. A valid Ontario Drivers Licence is an asset to this position. Please send a resume and cover letter to mugoli@mabellearts.ca by 5 pm, January 25, 2018. We thank you for your interest in the position. Only candidates selected for an interview will be contacted. Introducing placingparks.ca — our new digital toolkit! MABELLEarts is pleased to present Placing Parks in the Cultural Landscape: A guide for artists, funders and agencies. This project archive and toolkit has been designed to help artists, funders and agencies develop community-engaged arts projects in parks and public spaces. placingparks.ca includes a wealth of resources on how to initiate participatory art-making and community-building projects, build successful partnerships and think about park design and use with engagement goals in mind. The toolkit was created in the aftermath of Welcome To This Place. It draws both from MABELLEarts’ 11 years expertise as well as from learnings gathered over the course of our national project. The toolkit is available both in English and in French. We thank Canadian Heritage for funding this exciting project, which was a joy to put together. We hope Placing Parks helps you envision artful projects that bring people together in your local park! MABELLEarts is a community arts organization that brings together people of all ages, backgrounds and abilities to make art and build environments that foster community regeneration, invention and connection. We cultivate long-term relationships that reveal the transformative possibilities within each unique site and neighbourhood. We celebrate cultural traditions, differences and points of connection that help spark collaboration as a creative force for change. We are seeking an emerging Community Arts Administrator to join our team from October 15, 2018, to March 29, 2019, to coordinate all digital and written communications; assist with community communications and outreach; and support the running of the MABELLEarts office. The Community Arts Administrator will work from the MABELLEarts Office (5005 Dundas Street West) and off-site as needed. - The candidate will possess a high level of computer skills: proficiency in word, excel and special consideration will be made to candidates with Quickbooks, Sumac, and/or Adobe suite proficiency. - The candidate will demonstrate familiarity with social media networks in particular: Facebook, Twitter and Instagram. A valid Ontario Drivers Licence is an asset to this position. - have not previously participated in or been paid under this or any other Career Focus internship program funded under the Government of Canada's Youth Employment Strategy. Please send a resume and cover letter to karen@mabellearts.ca by 5 pm, September 28, 2018. We thank you for your interest in the position. Only candidates selected for an interview will be contacted. Broadacres Park is very big! The best way to find us in the park is to go to Broadacres Junior School at 45 Crendon Drive. Our location is in the park directly behind the school (see map below). (We do NOT recommend going to any other addresses on Google Maps that are listed for Broadacres Park). - Walk through the school parking lot into the park. Join us for Welcome To This Place in Broadacres Park! MABELLEarts is pleased to welcome you to join us for an outdoor night market: a performative celebration of our summer in Broadacres Park, Mabelle Park and across the country. Come out enjoy an evening of exchanging stories, songs, delicious treats and more! Free! This event marks the culmination of the Toronto portion of Welcome to this Place, a national project, produced by MABELLEarts, involving high-impact organizations and professional artists in Toronto, Montreal, Halifax, Winnipeg and Vancouver. 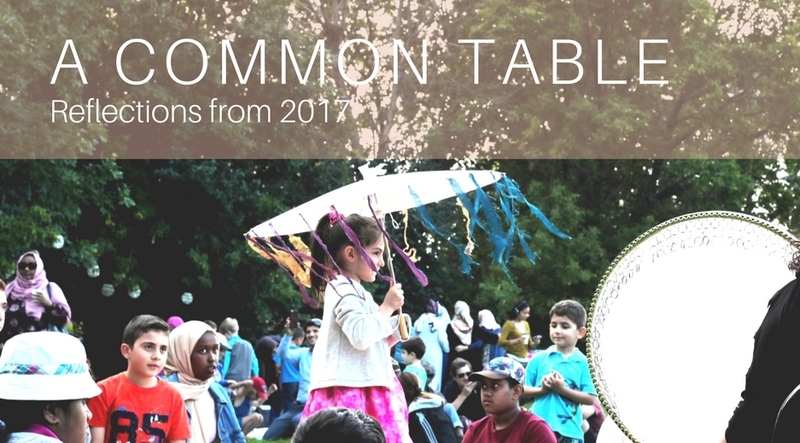 Together throughout the summer, we've been creating a series of collaborative projects and events that promote urban parks and public spaces as places of arrival where newcomers to Canada can find friendship, cultural and creative expression, connection to their new country and to more established Canadians. and guest artists from across the country! Announcing Welcome To This Place: our first national project! MABELLEarts is pleased to announce our first national project: Welcome To This Place! MABELLEarts a le plaisir d'annoncer notre premier projet national: Welcome to this Place! We are delighted to welcome two Community Arts Coordinators to our summer team: Azka Coudhary and Sonya Zhang. Over the past few weeks, Azka and Sonya have already been playing key roles in helping produce our weekly Iftar Nights: in the second half of the summer, they'll be working closely with teams of MABELLEyouth, leading workshops in Mabelle and Broadacres Park. We could not be more pleased to introduce our new Managing Director, Karen Kew. Karen has been with us since January and is already making incredible things happen at MABELLEarts. Karen has over twenty years of experience in the not-for-profit sector as an administrator, project manager and at a board level. She is passionate about community development and driven to use her organizational skills to create effective systems so that people and organizations may thrive. While her background is in the arts, graduating with a BFA from York University, she has also worked extensively in the settlement sector focusing on financial management, systems improvement, managing change and engaging diverse communities. Karen has served on numerous boards, most recently as Treasurer for the Guelph Neighbourhood Support Coalition and as Chair of CFRU 99.3FM community radio station. We are seeking a Communications Consultant (an individual or company/firm) to play a key role in strengthening our social media, public relations, and digital footprint, throughout this busy programming time and period of organizational growth. MABELLEarts is committed to creating high-impact digital materials that amplify the reach of our community projects and share community stories of success. This summer, we are excited to increase our online impact as we scale-up programming, with the help of a Communications Consultant. The ideal candidate will have a passion for, and experience in, public relations, social media, graphic design, and a strong overall understanding of marketing and communications. Apply by April 13th 2018. Join MABELLEarts and be a part of something special! This position offers flexibility (including ability to work partially from home or as a .8 position) for the right candidate. MABELLEarts is seeking a Managing Director to provide strategic leadership and manage the operations, human resources and financial systems necessary to ensure that MABELLEarts exceeds our goals and objectives. MABELLEarts is an innovative, community-centered organization – we’re excited to welcome someone new to the team to help us through this exciting next phase of growth and adventure. This senior management position reports to the Artistic Director. Develop and manage operational and financial systems and oversee the core day-to-day administration of MABELLEarts, including human resources and finance. Ensure MABELLEarts continues to comply with organizational policies; funder regulations and non-profit legalities. You have significant fundraising experience and have successfully secured and managed large, multi-year budgets and raised funds exponential to your salary level. You have a proven track-record managing small teams and driving performance, while helping to create a supportive, positive and learning-focused work/culture. It’s possible that you’ve been working in a larger organization and are ready for a change of pace. You may be at the mid-point of your career and looking for a high-impact position with some flexibility. You may have experience in the arts, but if you don’t, you definitely understand its power. You excel in a fast-paced, ever-changing environment and tend to enjoy all kinds of personalities. You bring new ideas and innovation while recognizing what works. You are self-aware, eager to learn and know you also have things to teach and share. You’re committed to equity, inclusion and social justice. Oh, and a valid driver’s licence is an asset. Applications must be received by December 5th, 2017. Our office is located in a Toronto Community Housing high-rise tower that has been equipped with automated entrances and exits. Our washroom is wheelchair accessible. To discuss accommodation, please contact the Artistic Director at 416-239-4900 or by email – leah@mabellearts.ca at your earliest convenience. To be considered for this position, please include a cover letter with your resume. We will be in touch with candidates who we wish to connect with for an interview and we’d rather not discuss the specifics of the position by phone. Thank you for your understanding and your interest. We're delighted to welcome Nick Vo to our team. Nick will be with us until April, completing a UofT Urban Studies placement with MABELLEarts! Thanks to Denise Pinto for connecting us! Nick is currently a fourth year student at the University of Toronto double majoring in Urban Studies and Human Geography. He is an advocate for social justice and has experience working with newcomers and other marginalized youth through working on community arts projects with organizations including: Access Alliance, Children’s Peace Theatre, Arts in the Parks and VIBE Arts. Nick combines his knowledge in human geography and urban studies with skills in listening to, supporting and coaching young people, using conflict resolution and other creative and compassionate approaches to solve problems and achieve goals. He hopes to become a social worker in the future and is always seeking opportunities to learn.